When her husband comes out as gay and an airplane crash inexplicably destroys her home, the mother of teenage twin daughters must rethink everything she knows. In her debut novel Water on the Moon, Jean P. Moore introduces readers to Lidia Raven, whose life begins taking seemingly endless wrong turns. Lidia and her girls miraculously survive the plane crash that destroys their home and are taken in by Lidia’s friend Polly, a neighbor with a robust collection of first-edition books who lives alone on a sprawling estate. Struggling to cope with each of these life-changing events, Lidia discovers a connection between herself and Tina Calderara, the pilot who crashed into her home. In the months that follow, Lidia plunges into a mystery that upends every aspect of her life. Rife with age-old dilemmas, this contemporary novel explores the relationships between mothers and daughters and the trials and triumphs of women’s friendships. As Lidia learns to reconcile her pain with her need to be true to herself and to accept that need in others, she discovers that while life has the power to unhinge her, it also has the power to open her to new ways of being in the world. 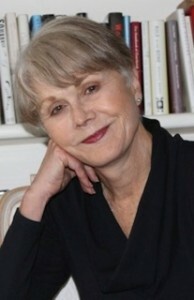 Jean P. Moore began her professional life as an English teacher, later becoming a telecommunications executive. She and her husband, Steve, and Sly, their black Lab, divide their time between Greenwich, Connecticut and the Berkshires in Massachusetts, where Jean teaches yoga in the summers. 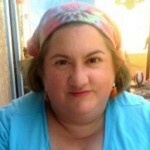 Her work has appeared in newspapers, magazines, and literary journals such as upstreet, SN Review, Adanna, Distillery, Skirt, Long Island Woman, the Hartford Courant, Greenwich Time, and the Philadelphia Inquirer. 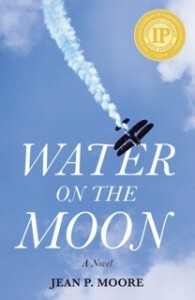 Water on the Moon was published in June of 2014 and won the 2015 Independent Publishers Book Award for Contemporary Fiction. 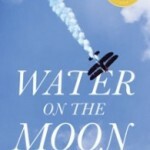 While I don’t pay attention to whether or not a book has won awards when I’m in the process of reading it, it was easy to see why Water on the Moon has done so. This novel opened with a bang (literally: a small plane crashes on top of a suburban house), and while the pace isn’t exactly breakneck, the story never plods, but unwinds like miles on a road trip where the scenery is ever-changing and yet, still similar enough to be part of the same region. I really liked that all of the main characters – Lidia, the girls, Polly, even Harry the FBI agent, and Owen (Lidia’s ex, met mostly via phone calls) were all fully realized, and each one had her (or his) own story arc. So many times children in novels are just accessories, but I’d happily read a novel from either of the girls’ point of view – they’re all that compelling. As Lidia learns that there was a connection between herself and the pilot of the crashed plane, a woman named Tina, the plot becomes deeper and more intricate. Suddenly, instead of a suburban housewife with a personal disaster, we’re delving into family history, literary history (I love that Byron is part of the plot. Byron is a favorite of mine. ), aviation history, and so much more. Lidia’s world, and, indeed her family, both literally and in terms of how she defines family, both expand. As I said, all of the characters were fully realized, dimensional people. Any of them could live in your neighborhood. What I also loved was the author’s use of language – nothing ever felt too stilted or too slang-y – and her use of detail. The juxtaposition between Polly’s ancient black CORDED phone and her completely up-to-date computer, for example, was rich and vivid. I felt like I could see, smell, and touch everything. I also particularly liked the way the title was referenced (and relevant to) the novel as a whole, but I won’t spoil that happy surprise, because it’s a key moment in the story. Suffice to say, this is no ordinary novel, it’s a breathtaking glimpse at a life that’s just a little bit less ordinary than our own, in a reality that’s ever-so-slightly heightened. Goes well with hot coffee and apple tarts served on a rambling porch on a crisp fall afternoon. All partakers are wrapped in cozy flannel throws, of course. Contest is open until 11:59 PM CDT on Sunday, October 25st. Winner will be notified by email (or Twitter), and must provide their mailing address, which will be forwarded to the publicist for fulfillment.